Federal University of Agriculture, Abeokuta, FUNAAB Centre of Excellence in Agricultural Development and Sustainable Environment (CEADESE) Specialized Postgraduate Admission Form, Courses, Eligibility, Duration, Requirements and Application Guidelines for 2018/2019 Academic Session. The Federal University of Agriculture, Abeokuta is pleased to announce that admissions into postgraduate training programmes at the Centre of Excellence in Agricultural Development and Sustainable Environment, are now open. Applications are invited from candidates of all nationalities. -PhD.AgSE (Options: Crop Production, Plant Breeding, Seed Technology,Crop Pathology, Crop Protection, Crop Entomology, Pasture Agronomy and Pasture Production). -PhD.AgSE (Option: Food Processing and Value Addition). -PhD.AgSE (Options: Hydrology and Climate Change, Environmental Geophysics, Remote Sensing and Climate Change, Environmental Safety). Limited scholarships in form of tuition rebate and research supports are available. Admissions into CEADESE programmes are based on regional and gender balance. Non-nationals of Nigeria and Women are therefore encouraged to apply. The M. AgSE programe will generally be open to all Agriculture, Engineering and Science graduates of B.Sc, B.Eng, B. Agric, B.Sc Agric, B. Tech Agric and B. Eng Agric. etc with a minimum of Second Class Lower. Holders of HND and other Degrees/Classes of Degree with PGD in any of Agriculture disciplines with a minimum weighted average score of 60% (or CGPA of 3.0 on a 5point scale) shall also be eligible for admission into the programme, on the condition that both set of candidates met basic university matriculation requirements of five (5) O’ level credits including English Language and Mathematics, and any other three (3) Science or relevant Social Science subjects. Food Processing and Value Addition is open to Bachelor Degree holders in Food Science related disciplines Environmental Systems and Climate Change is open to Bachelor Degree holders in Civil Engineering, Water Resources and Environmental Engineering, Basic, Applied and Environmental Sciences and related disciplines. The PhD AgSE programmes will be open to Master degree holders in courses that are relevant to the different options in the programme. Course work along with dissertation for a maximum of 4 Semesters. 2-3 months of Internship in collaborating industries, parastatals and institutions. PhD AgSE programme will be course and research-based, spanning maximum of 6 semesters. Application for PhD AgSE is open all year round. All applicants from Nigeria should generate an invoice at the Post Graduate application portal of CEADESE- FUNAAB at http://pg.unaab.edu.ng/pgc.html. The invoice should be taken to any branch of Zenith Bank to make application payment of N1 5,000.00. exclusive of bank charges and thereafter complete the application form at the same portal. 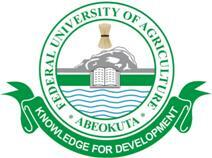 Account Name: Centre of Excellence in Agricultural Development and Sustainable Environment, FUNAAB. Foreign applicants should pay US$100 into the Centre’s domiciliary account (Zenith Bank Account No: 5070318907, Swift Code: ZEIBNGLA, Bank Sort Code: 057170019). It is important to upload the telex copies to access the online application form. The Director, CEADESE, Federal University of Agriculture, Abeokuta, P.M.B. 2240, Abeokuta, Nigeria. All applicants must request their respective institutions (University) to forward their transcripts directly to CEADESE at the same address above. Applications for M.AgSE programmes close by Friday, 3rd May, 2019. For further information, please send your enquiries to the following contacts; E-mail: ceadese@funaab.edu.ng.